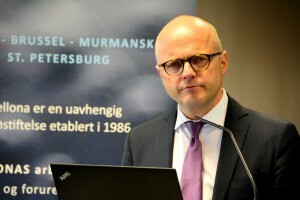 “It’s totally unacceptable that Nikel’s emissions continue – we have told he Russians that emissions must go down,” said Norwegian Minister of Climate at the Environment, adding that ongoing sulfur dioxide pollution from the Murmansk region’s Kola Mining and Metallurgy Company has kept relations between Moscow and Oslo bitter for too long. Vidar Helgesen, Norway's minster of climate and the environment, at Bellona's seminar Wednesday. President Vladimir Putin declared this year Russia’s Year of the Environment, but not much has changed. The country continues to rely on unsafe nuclear power plants and allows other nuclear facilities to rot and fall; its government torpedoes environmental groups as “foreign agents,” and despite promise after promise, the Kola Mining and Metallurgy Company continues to coat northern Norway in a cloud of heavy metals, much of it wafting in from the industrial town of Nikel 40 kilometers on the other side of the Norwegian border. On Tuesday, Helgesen and Donskoi met in Oslo, and Donskoi shied away from making any new promises. In recent year, Nikel has produced more sulfur dioxide emissions than the whole of Norway. Russia recently adopted legislation obliging Russia’s 300 most polluting companies to adopt so-called best available technologies, or BAT. The Kola Mining and Metallurgy Company is on this list, and it has been ordered to make upgrades by 2019. The company’s parent group, Norilsk Nickel, has promised to spend billions on modernization efforts, but little of that seems to be making its way to the Kola Peninsula facilities. Putin’s environmental years has also seen more environmental groups harassed into closure under the Kremlin’s NGO law on foreign agents. In 2015 Bellona Murmansk landed on the foreign agent blacklist and closed ot avoid a costly court battle. It was followed early this year by the Environmental Rights Center Bellona in St. Petersburg. As of early last month, 154 non-profits are listed as foreign agents – a loaded term ordinary Russians react to with suspicion – though the list recently dropped to less than 100 as numerous targeted NGOs shut their doors. Russia’s 2012 NGO law targets non-profits that receive even minimal international funding and engage in fluidly defined “political activity.” Once a non-profit winds up on the Justice Ministry’s list of foreign agents, they are subject to crippling fines, microscopic audits, regular police raids, and eventual shuttering for failing to comply with ever more shifting rules and mounting fines. By 2015, as the law approached its third birthday, it had forced the closure of more than a third of the NGOs in Russia, which included not just environmental groups, but legal aid organizations, women’s rights groups, historical societies, public opinion surveyors, and even bird watching organizations and pet shelters. To survive, groups must adopt the foreign agent label, which vastly complicates and stigmatizes civil society work in Russia. Is there any hope for the Year of the Environment? 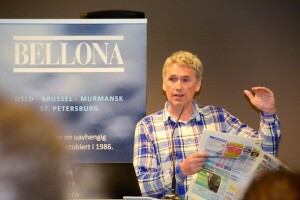 Thomas Nilsen, editor of the Independent Barents Observer news portal in Kirkenes, Norway, speaking about the difficulties journalists face working in Russia and Bellona's seminar. 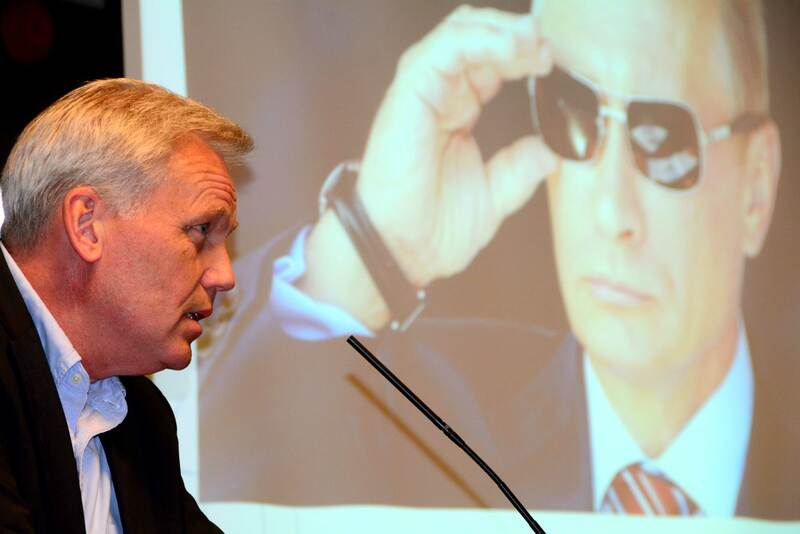 Thomas Nilsen, editor of the Independent Barents Observer news portal in Kirkenes, Norway, spoke of censorship and the difficulty for journalists working in Russia – but also insisted there were positive things to celebrate. But he said it’s harder to discern how things are going elsewhere, particularly the Kola Mining and Metallurgy Combine, where several months ago Nilsen took a tightly choreographed tour of the facilities in Nikel. “The Russians are very careful about where you move and what they let you see,” he said. Following his trip, in March, he was told he’d been banned from traveling to Russia. Subsequently, his newspaper came under a cyber-attack. At the seminar, Bellona’s general manager and nuclear physicist Nils Bøhmer also presented Bellona’s newest report on Russia’s nuclear industry.